Joe Posnanski had an impossible task. As he wrote before the book was published this week, he confronted an unprecedented challenge: writing a biography of someone who was suddenly engulfed in a national scandal—one that upended his reputation—and then died a few months later. I can’t imagine a worse scenario for a journalist. Joe Paterno was a complex, complicated guy—far more so than most of what’s been written about him would suggest. That includes my own work in two stints as a beat writer covering the team, and that’s been true since well before the Sandusky scandal broke. Paterno was tough to get close to. But if this isn’t the book Posnanski signed up to write—with the Paterno family’s explicit cooperation—in 2011, it’s also not the definitive account of Paterno’s life. It’s too soon for that book. There aren’t any blockbuster revelations, and the choicest new details, about Paterno sobbing the day after he was dismissed, about how his family had to force him to read the grand jury presentment, about the “I Hate Jerry Sandusky Memo,” made their way into the media quickly through excerpts. And, honestly, most of what was in the book, I already knew. But keep in mind that I covered my first Penn State football game, for The Daily Collegian, in 1988, and that I’ve followed Penn State football and Paterno not only because I love college football and I’m a Penn State alum, but because my job required it. I’ve read every book written about Joe Paterno, even Joe Paterno: The Coach from Byzantium by his brother, George. Some Penn State fans, I’m sure, will feel the same. This book covers a lot of familiar territory—far more pages are devoted to Paterno’s rise and his glory years than to the Sandusky scandal and aftermath, or even to the down years of the 2000s, which have been less well chronicled and deserve (I could say, need) a more full accounting. Posnanski is a lyrical, poetic writer, and he tells those familiar tales beautifully. He adds a few choice details. I expected nothing less. In State College, even the grocery stores are selling the book. Posnanski also does an excellent job showing the toll that the pursuit of excellence can take on family life; particularly when Paterno is designing his new defense in the late 1960s, Sue and the kids are on their own. It does, however, take a long time to get to the new stuff, and those parts of the book aren’t as richly reported. There’s a chapter on Paterno’s relationship with Jerry Sandusky that clearly spells out the differences between the two men and the fact that they weren’t friends; I think this will come as less of a revelation to anyone who’s followed the program closely, but that chapter is a good read. 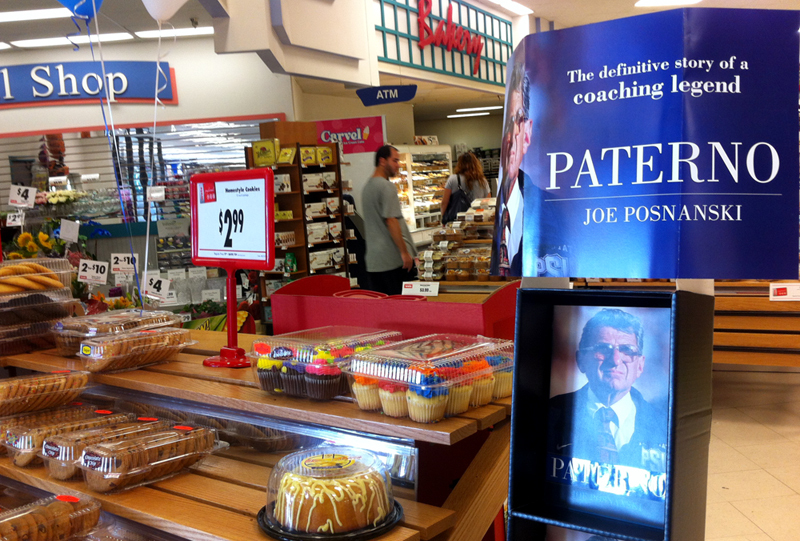 Scott Paterno, son and lawyer, and Guido D’Elia, friend and marketing genius, wrestle with the presentment and its aftermath; anyone who cares about Joe Paterno will be sad as they read those scenes. Most reviews, however, have found Posnanski’s portrayal, as Dwight Garner of the New York Times called it, “breezy and largely sympathetic.” Rich Hofmann of the Philadelphia Daily News calls it neither a “prosecutor’s brief” nor a “full-throated defense.” Beat writer Mark Wogenrich ’90 of The Morning Call in Allentown provides a great framework for understanding the book using an anecdote about Paterno’s recruitment of John Cappelletti. Guy Cipriano, the new beat writer for the Centre Daily Times, writes that Posnanski “whiffs” on this book because he didn’t make the most of his exclusive access to Paterno, and that’s a take well worth reading, too. Now that’s something I’d like to know more about. You can learn a lot about someone by understanding their relationships—particularly the choice of a life partner—and breaking down the Paterno marriage would have been insightful. But that thread is never picked up. And it’s not the only one. In a few places, Posnanski zeroed in on the contradiction that I’ve never been able to understand: How was it that a man who spent his life preaching the value of education, preparing his football players to live a productive life away from the football field, wasn’t able to walk away himself and enjoy the other facets of his own life? I’m sure I’m not alone in wanting to know a least a little more. Perhaps in another decade or so, enough time will have passed that more reporting can be done. For now, this book is as close as we’ll get. Entry filed under: Uncategorized. Tags: Guido D'Elia, Joe Paterno, Joe Posnanski, Rip Engle, Scott Paterno, Sue Paterno. It is kind of funny about the reviews. The reviewers themselves are giving the reason why they were not invited to write the book. Some of these “reviews” are so biased and full of the writer’s own opinions about Paterno(see the Atlantic review…sheeesh) that you wonder if they had the review finished before they read the book. As far as the short shrift given to his early life, I would guess that was covered in “By The Book.” The only thing I would care about reading a book like this is 1) Is it a good read? and 2) Is it factually accurate?. 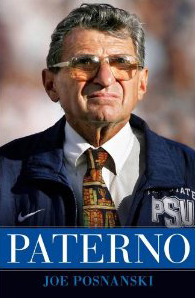 Finally, the book is a biography about Paterno, not Curley, Spanier, BoT, et al.